Today on the blog, I’m so excited to interview Megan Moran, Stylist and Entrepreneur. In addition to being a stylist, Megan owns a fashion truck (my dream) called The Style Foundry. She is primarily focused on the busy professional and helps women organize their wardrobes and refine their personal style. Without further ado, here’s Megan! I'm one of those weirdo kids who knew what they wanted to do since the 4th grade! Growing up in a family of entrepreneurs I was always encouraged to find my passion and pursue it. In the 4th grade I determined my passion was for fashion so naturally I thought that meant I should be a fashion designer. Turned out my drawing skills weren't the best but what I did realize was that I drew things I had seen when out shopping with my mom. I was simply turning the individual pieces into outfits. By 6th grade I had done enough research to figure out this is what a stylist did and knew from then on that being a stylist was my path. In high school I started my business as a blog where I taught people how to Mix + Match their pieces properly. I soon realized that writing was not my passion; instead physically helping people was more interesting to me, which is when I transitioned from the blog to services. I dabbled in this through High School and College, took jobs in the fashion industry to build up my portfolio and expertise, and then my husband and I moved back to Chagrin Falls and I started The Style Foundry full time (2017). Over the years (and even seasons) my style has changed but to the core I've kept a similar message- Classic Prep with a Touch of Glam. When I was younger I showed off this style by trying a lot of trendy pieces and going to stores like J.Crew and BP at Nordstrom. Back then the outfits were a bit more “out there”, experimental (like a long sleeve under a polo) and ill-fitting. Since then I have refined my style by finding the right fit, silhouettes, quality and fabrics, colors, and prints that work best for me. Each season I notice the pieces I like or details I'm into might change but at the end of the day it still ties back to Classic Prep with a Touch of Glam. We’ve all made style faux pas in our lives - Please provide an example of an outfit you wore in the past that makes you cringe when you think of it today. It's a process. Don't feel like you have to define your style so quickly. If you like it, wear it, and if you continue to do that you'll come to find your true style. My focus is to stay within my color palette and the silhouettes that best match my shape while making sure I only have enough pieces for the variety I need (aka not overpacking my closet.) I'm always focused on Mixing + Matching my pieces as much as I can and find it's helpful to do this by having neutral bottoms and jackets and then using jewelry, tops, and dresses for variety. Looking at your own closet, what are your favorite investment pieces (2-3 max) and what trends are you loving this season? My 3 favorite investment pieces are great work pants, a long sleek jacket, and comfortable shoes. When it comes to trends, I like to look at them more like a buffet- if you like something you get it and if not then no worries! Just pass it by. So for the upcoming fall season, the trends that work for my style are: Houndstooth and Plaid, Fall Florals, and Statement Coats. What Bombay Taxi piece would you pick as a must-have for your closet? I almost always recommend a gold cuff for my client's closets. 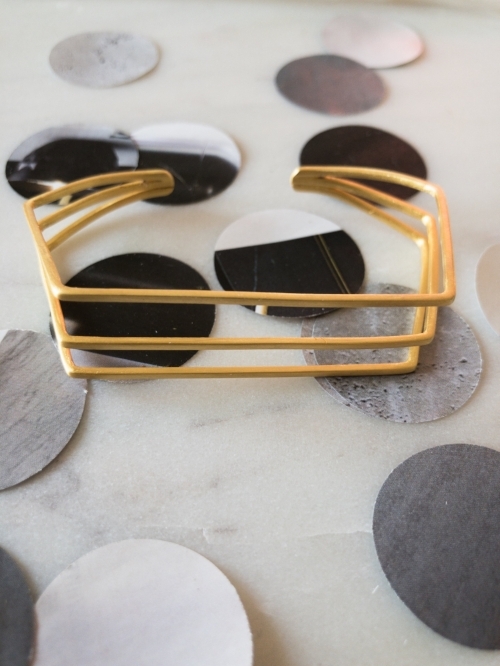 Cuffs are simple and classic and pair well with all outfits - they’re even better when you find one with a cool twist! If you don't love it don't get it. Every piece you own should make you excited! If you are buying a piece just because it's on sale or even if it doesn't fit right then it's just going to hang in your closet or make you feel bad when you wear it. When clothes don't fit right and aren't showing off your amazing figure! It's hard right now with the industry because of insanity sizing and the way things are cut. But making the effort to find the right piece or get things tailored is SO worth it! What are some style blogs you follow? I don't follow any style blogs but do love to learn from these amazing girl bosses: Jenna Kutcher, Joanna Gaines, Emily Schuman, and Mallory Ervin. Thanks to Megan for participating in this interview. 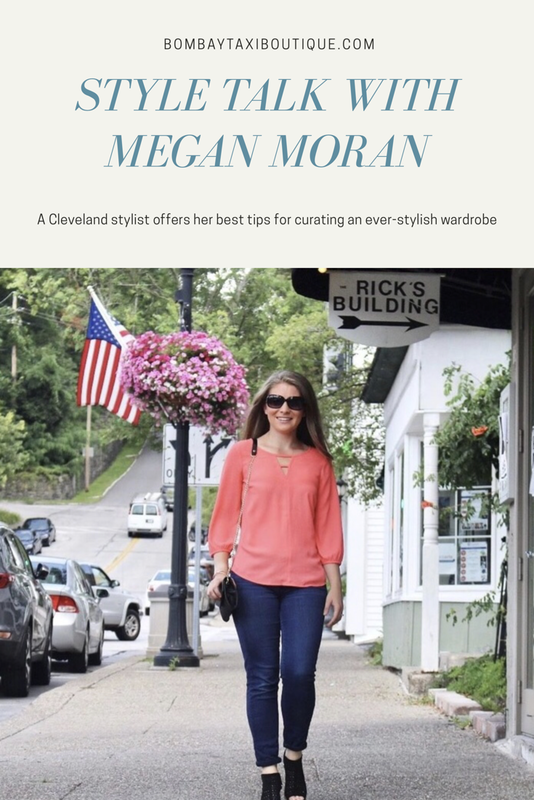 You may learn more about Megan or book her services on her website, https://www.thestylefoundrycle.com or on Instagram: @stylefoundrycle or Facebook . If you would like to pin this post for your style board, you’re welcome to use the picture below!